The course is quintessentially ‘Bunbury’, passing the City's major attractions, landmarks and what some may call its' toughest hills. Two complete circuits of the course stretches 4.5km. The fastest teams are expected to complete the course in around 25 minutes but all teams have 60 minutes in total to complete the course. Runners have to be fit, fanatical and frankly a bit mad, while the Bed Bug (passenger) has to be light, be able to shout loudly and be happy to place their safety in the hands of their team of runners. Teams can participate competitively or register to participate just for fun! Simply note your preference on the team application form. Race winners and teams placing second and third, will be custodians of the perpetual trophy for 12 months, which will be engraved with the name of the winning team. We encourage winners to display the trophy proudly in their place of business or clubrooms for the year the trophy is in their possession. Every participant that finishes the course will receive a limited edition ‘I Finished the Great South West Bed Race’ T-shirt and a voucher entitling them to a free sausage sizzle and can of cool drink. 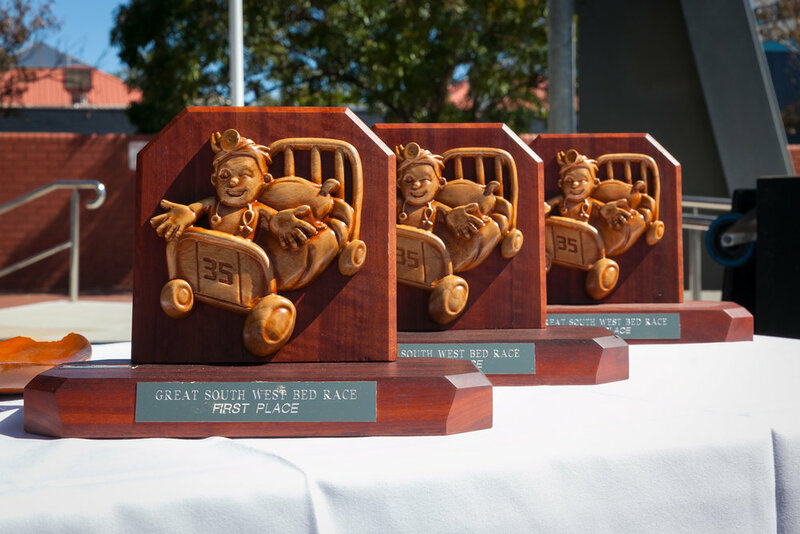 Funds raised from the 2018 Great South West Bed Race is a whopping $35,000. To achieve this goal, and in order to enter the race, teams raised a minimum of $2,000 for adults, $750 for junior teams and $5,000 to enter the CEO Sprint with all monies raise going to the St John of God Foundation South West Campaign. When it comes to tradition, a theme is as important to the bed race concept as the racing beds themselves, offering racing teams yet another competitive opportunity! 2019 Race Theme: PLANES, TRAINS AND AUTOMOBILES! An opportunity to get creative - use the above as inspiration to think outside the square. Before the race itself takes place, all participants join in the Grand Parade, led by the winners of the best dressed team, having decorated their beds AND dressed themselves in costumes chosen to reflect the theme. And there are of course trophies up for grabs for those teams who come up with the most imaginative interpretation of This years' theme, “TRAINS, PLANES AND AUTOMOBILES"! So, where can you gather inspiration for your team’s entry into the Great South West Bed Race? First, take a trawl through Google - think movies, pop culture; how about KITT from Knight Rider or the Batmobile? The sky is your limit. Whatever your team’s interpretation of “Planes, Trains and Automobiles”, be sure to voice your choice ASAP, because it’s first come, first served for this year’s theme. So, get in quick!! !